Imagine your next vacation with perfect waves for surfing and body boarding, gorgeous beaches for sun and swimming, long ocean walks, kayaking, outstanding snorkeling and scuba diving just footsteps from your front door. Not to mention, after the day's activities are a memory, there is a large hot tub and a hammock for total relaxation and enjoyment of the glorious tropical evenings outstanding Poipu sunsets, and star studded skies. 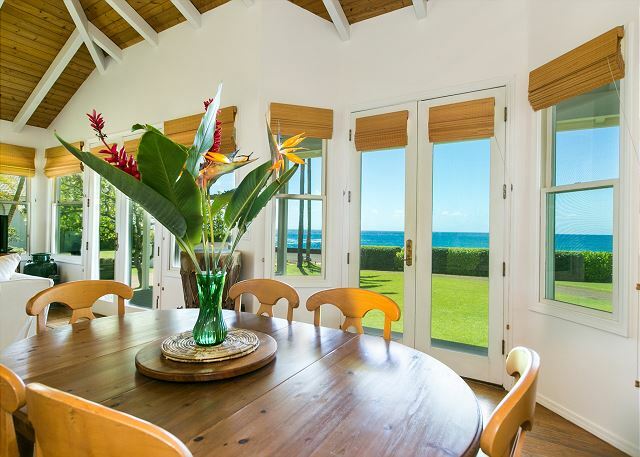 The flurry of sea life visible from the expansive lanai that runs along the ocean side of the house include dancing dolphins, whale breaches, an array of turtles, seabirds with scenic sailboats and kayaks enjoying the sea life and sunsets. From Koa Cottage you can take a short walk along the ocean to shopping, dining, an orchid garden and a farmer's market. 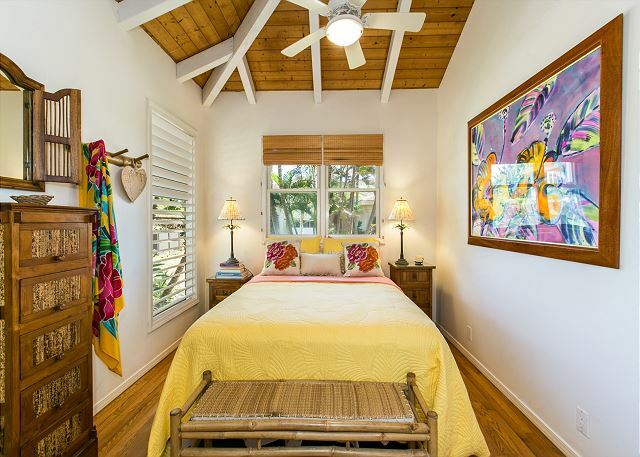 The cottage is perfect beach house with high, vaulted ceilings, 2 bedrooms with a sofabed and 2 baths. There are ocean views from every room! 24/7 on-Island Manager is Poipu365, (808) 742-7677 or after hours emergencies call (808) 639-7801. Amazing house, beautiful front lawn, right in front of the ocean. Checkin and checkout was very easy. Worked for 6 adults. Hot tub was amazing, hidden loft with a blowup mattress already, huge master bedroom, awesome double hammock, outdoor and indoor dining space, modern electronics, close to everything. Agency was easily contactable however Vicky was pretty rude to me while I I was attempting to pay over the phone as I quote “that’s a lot of work for me” (had to ask her to split it over two cards as 5000 USD is over my Australian dollar credit limit). One small negative experience while booking aside, was an absolutely magical place and we would go back in a heartbeat. It’s bigger than it looks in the pictures! Overall, I'd absolutely recommend this property. For this part of the island, you can't beat the location or outdoor space offered with this type of view. That being said, know going in that that's what you're paying for - and honestly, it's still well worth it. For the price point, I was underwhelmed by the interior (primarily the kitchen and bathrooms) as those could use some updating. Many of the fixes have been made suggested in prior reviews (everything was functional). The furniture was nice and visually pleasing, though we didn't spend a lot of time inside the unit. There was also a good supply of beach items (chairs, sand toys, boogie boards) and beach towels offered. The kitchen was very well stocked and we were able to easily cook dinner in. One recommendation for the property would be additional plastic drinkware - the intro note upon check-in made reference to using plastic near the hot tub but there were only 2 large plastic cups - again, at this price point (especially when hoping people use them), I'd expect a broader selection. Again, I'd recommend this property but there are a few minor enhancements that could raise guests' overall experience. Some may think the price is high but what is provided allows for buying less for what would be left behind. The kitchen has spices, oils, kitchen utensils to cook a full meal. Fantastic setting for sunsets. Very close to easy snorkeling. Driving to many venues is easy. All you have to do is walk and explore. Hot tubbing watching whales! We spent 4 nights over Christmas at Koa Cottage and loved it. This property had earlier gotten some negative reviews so we were a little apprehensive but that quickly disappeared upon our arrival. The location is great, directly across from the water where we saw sea turtles swimming and a beautiful sunset every day. We walked and drove (with all the gear) to nearby beaches for great snorkeling. There were some things (hammock, grill, master bedroom door, ladder to loft) that need to be updated/fixed. If those fixes are done, this place will be spectacular. We would rent this cottage again if we return to Poipu. This home is in the best spot on Kauai. Within steps of the ocean! Very quaint home with 2 bedrooms and 2 full bathrooms. We loved watching the sunset every night from the front porch while sailboats flow by. Very nice snorkeling spots within walking distance as well. We loved every minute of this paradise away from home. Aloha Michelle, mahalo for taking the time to share this wonderful review. We are so glad you and your family enjoyed your stay at the Koa Cottage. We hope that you will consider the Koa Cottage or any of our Poipu 365 vacation rentals for the next time you visit the Garden Island. It is with fond Aloha that we bid you farewell... Malama Pono (take care)... A Hui Hou Kakou (until we meet again). Aloha Killian, Mahalo for taking the time to review Koa Cottage. We are so happy to hear that you enjoyed your stay! 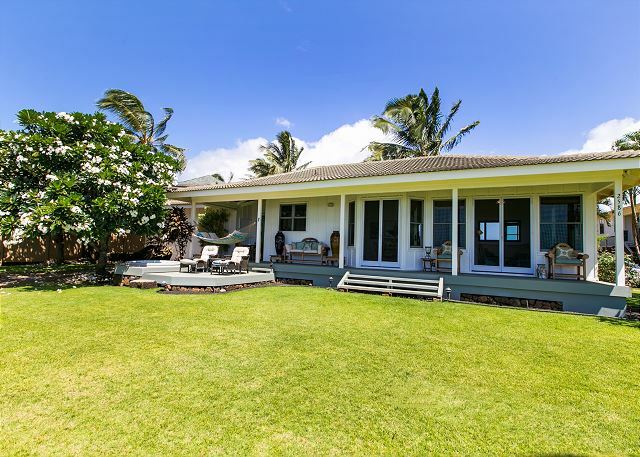 We hope you will again consider choosing Koa Cottage or any of our Poipu 365 vacation rentals on your next visit to the Garden Island. Know that the goal of our team at Poipu 365 is to share the Aloha spirit and service with all our destination visitors. It is then with fond Aloha that we bid you farewell...malama pono (take care)...a hui hou kakou (until we meet again). Relaxing by the Ocean - and with Sea Turtles! 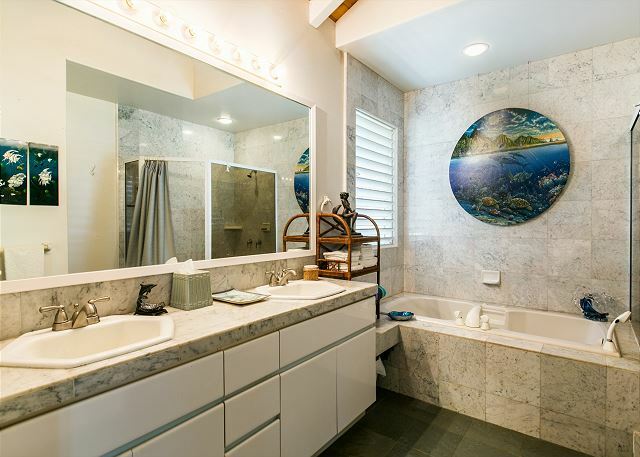 Whether you're sipping coffee on the lanai, swinging in the hammock, relaxing in the hot tub, cooking a tropical dinner in the kitchen, watching the sunset from one of the many places to sit in the yard or even watching a movie on the couch, views of the ocean and the accompanying sea breeze are plentiful at the Koa Cottage. As a bonus, a family of sea turtles (honu) can always be found in the water directly through the front yard and across the road. The location is close to a number of beaches, restaurants and shops. The previous reviewer is correct that the property is somewhat dated, but it sounds like the new property management company is continuing to work on improvements and we found the home very comfortable. We had one issue with a door knob, and the property management company fixed it that same day. Additionally, grill plates had been replaced. We stayed 5 nights with a 3-year-old and a 4-month-old, and have been missing the cottage ever since! Aloha Cory, mahalo for taking the time to review the Koa Cottage. We are so happy to hear that you enjoyed your stay! We greatly appreciate your understanding of our continuing improvements to the unit. We hope you will again consider choosing Koa Cottage or any of our Poipu 365 vacation rentals on your next visit to the Garden Island. Know that the goal of our team at Poipu 365 is to share the Aloha spirit and service with all our destination visitors. It is then with fond Aloha that we bid you farewell...malama pono (take care)...a hui hou kakou (until we meet again).